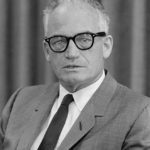 Barry Goldwater was an American politician, businessman, and author who was a five-term United States Senator from Arizona (1953–65, 1969–87) and the Republican Party’s nominee for President of the United States in the 1964 election. Despite losing the election by a landslide, Goldwater is the politician most often credited for sparking the resurgence of the American conservative political movement in the 1960’s. He was a vocal opponent to desegregation and the Civil Rights Act of 1964, believing it was an overreach of federal government. He also had a substantial impact on the libertarian movement. "If everybody in this town connected with politics had to leave town because of chasing women and drinking, you would have no government." "I would remind you that extremism in the defense of liberty is no vice! And let me remind you also that moderation in the pursuit of justice is no virtue." "I think any man in business would be foolish to fool around with his secretary. If it’s somebody else’s secretary, fine." "Nixon was the most dishonest individual I have ever met in my life. He lied to his wife, his family, his friends, his colleagues in the Congress, lifetime members of his own political party, the American people and the world." "Equality, rightly understood as our founding fathers understood it, leads to liberty and to the emancipation of creative differences; wrongly understood, as it has been so tragically in our time, it leads first to conformity and then to despotism." "I wouldn’t trust Nixon from here to that phone."